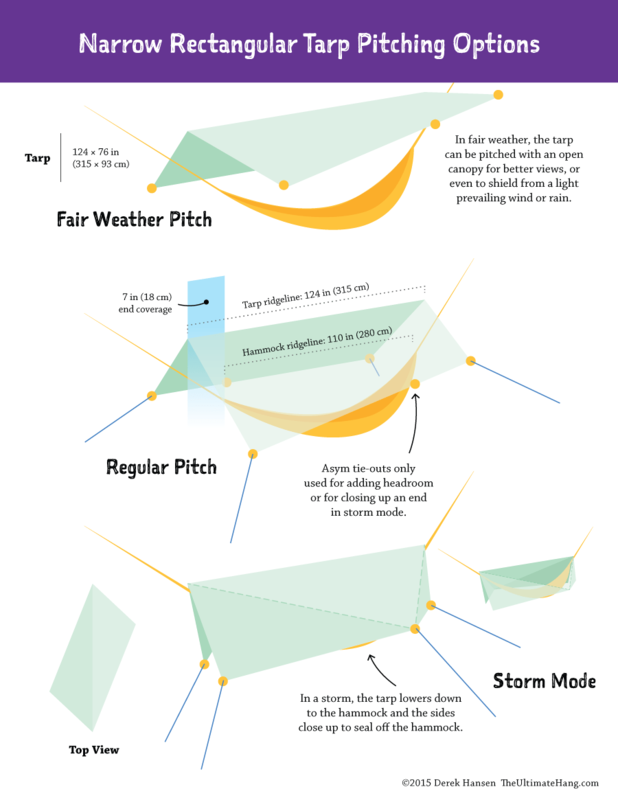 I’ve tested a few rectangular tarps recently and I thought I’d share this quick illustration to show the common pitching options I use with a long but narrow tarp. These work best with some after-market panel pull tabs, if not already installed. Rectangular tarps are great for minimalist hammock camping where you don’t need or care about having a palace of space. Pitching options for a rectangular hammock tarp. I read your book and immediately headed over to Hammockforums.com when I was done… Perfect combination for getting started with hammocking! Learned so much from your book that I’m using every time I head out, as far as hammock and tarp setup and other little ideas. I keep it on my phone so I can always look back at it when I’m out in the woods and needing a little help…. Thank you for the most complete book on hammocking! Hi Derek, thanks for your site and your Book. I’got one question. Is it necessary to fix the Tarp (mine is 3x4m) on the ridgeline, or is it just ok to hang the tarp over it an fix it with the pegs? The tarp doesnt have a Point at the middle of the 4 meters length. Or should i invest in some clips to get a fixation for the ridgeline? I’m not sure I completely follow you. To keep a tarp tautly pitched it needs to be tied down at all points. For a basic tarp that means the four corners and the two ridgeline points. Let’s say you just tied a rope between two points and draped a tarp over that and just pegged down the four corners. The ridgeline of the tarp would sag and droop. You don’t need any extra guy points besides those six main points although some tarps have extra ones that allow for more complex options. If your tarp doesn’t have any tie out points for the ridgeline than yes, you should add some. Sewing some grosgrain loops along the center line should be easy. You got it exactly. I Thought about drapping the Tarp (unfixed) over a Long ridgeline. The tarp should ne fixed with the pegs. But is sewing in some Loops the best way, or should i get some grip clips to avoid a sag of the ridgeline? I have this Long tarp for the draumr 3.0, because the original ist in my eyes too Short. Grip clips work. Whatever you are comfortable with. curious why not use 4 tie outs on the sides instead of 3? that would let you have a hex shape tarp plus doors on the end? When sleeping diagonally you don’t need that other tie out. Save weight and set up time. This is talking about a narrow rectangular tarp. If the tarp was wider, than yes that fourth tie out can help. so it’s more like an asym diamond tarp, with doors? interesting concept. if i had any DIY skills i’d have to do some experimentation with that concept. Nice! It does omit the most common pitch I use with my 8×10′ tarp with a hammock, which is to pitch it diagonally so I get more end coverage with my longer hammocks.